The Malaga Film Festival is one of the most important Festivals of Spanish Cinema in the country, and it is receiving also a growing recognition and prestige on the international level. This year, the Spanish Film Festival will be held in downtown Malaga from 17 to 26 March. You already know what to do in Malaga theses days… The city will be full of culture, art and professionals from the film industry. In our boutique hostel in Malaga we will dress in our best finery to enjoy the movies and culture during the Festival. Besides, at Alcazaba Premium Hostel we have a privileged location in downtown Malaga, so that our customers are able to experience from the row the great experience of the famous Spanish Film Festival in Malaga. One of the most important screening locations is the Cine Albéniz, which is just a few steps away from our youth hostel in Malaga. At the official wesite for the Malaga Film Festival 2017, you can check the full programme for the Festival and the movies shown in this cinema next to our boutique hostel in downtown Malaga. At Alcazaba Premium Hostel, we have joined this renowned event and have prepared a few Festival-related events with some familiar faces and professionals belonging to the art & film industry. 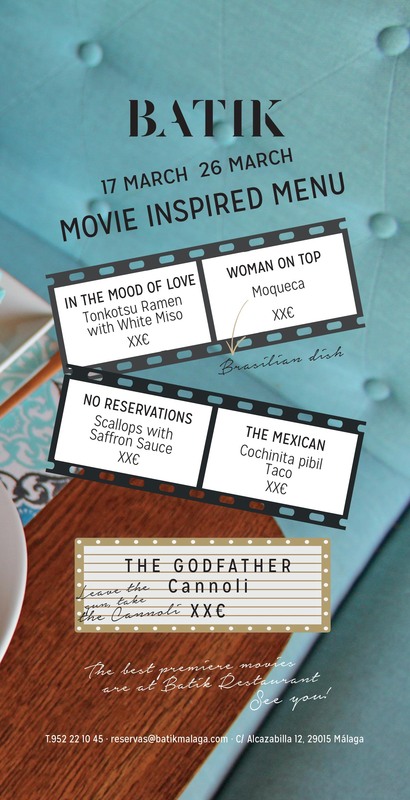 Do not forget that the best première movies are at Batik restaurant! Book now and “savour” the Spanish Film Festival too!